Drive-In Pallet Racking is a cost-effective way to store your goods. Colby Storage Solutions' drive-in racks are second-to-none. Contact us today. Drive-in Pallet Racking is the most popular form of high-density pallet racking, and is a more affordable option than some other alternatives. What is a Drive-In Rack? 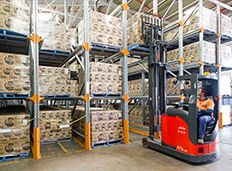 By using ledges instead of beams, forklifts are able to drive into empty rack locations, which makes the storage of multi-deep pallets possible. This is a great solution for situations where selectivity isn’t a necessity. Providing excellent storage capacity, Colby Drive-in Pallet Racking works on the first pallet in, last pallet out (FILA) principle. Suitable for large quantities of the same product and designed to ensure optimal performance at the lowest cost per footprint, our Drive-In Pallet Racking comes with a host of benefits. Heavy-duty bracing connects symmetrically to the upright drive-in rack, which increases the strength and load-carrying capacity of the racking, while reducing the amount of bracing required. Colby’s Drive-in Pallet Racking systems include innovative, one-piece, formed cantilever brackets that wrap securely around the upright. Backstops are positioned at the end of the pallet runners to prevent pallets from being pushed too far into the racking, eliminating potential damage to spine bracing and further increasing safety. Heavy-duty, purpose-designed floor channels help to guide forklifts into Drive-In Pallet Racking bays, ensuring quick and easy alignment, safer handling, and reduced risk of rack damage. For added protection, our patented Colby Protect-a-Rack wraps around the base of the racking uprights. Their angled profile deflects impacts, minimises damage, and maximises clear bay entry. Why Choose Colby’s Drive-In Racking? Designed by leading Australian structural engineers, Colby’s pallet racking is designed to ensure safety, integrity, and compliance, meeting rigorous international structural standards – and exceeding Australian standards. The storage solution at Sydney’s ALMC includes an ultra space-efficient drive-in pallet racking system, housing up to 2,100 pallets of ALMC’s fast-moving SKUs, and providing 1,100 pick faces.